Oregano is an herb native to the Mediterranean region and central Asia. It has been used for culinary purposes for centuries. The ancient Greeks must have understood its value as their name for the herb translates into "joy of the mountain." If you use the herb, you may not be surprised to find that it's more than just a way to spice up your meal. Besides being prized for its flavor, it also considered to have many health benefits as well. Perhaps one of the most noteworthy traits of oregano is its antioxidant properties. Did you know that oregano has been shown to have over 42x the antioxidant activity of apples, 30x higher than potatoes, and 12x more than oranges? It is also rich in vitamins and nutrients such as potassium, zinc, iron, protein, calcium, magnesium, fiber, vitamin B3, B6, C and E. But that's the small stuff! What interests scientists about this herb is not what is found in the farm grown oregano you add to your favorite pasta, but the remarkable properties found in the oil that is made from the leaves and flowers of the wild oregano plant that grows naturally in the mountainous Mediterranean regions. Oil of wild oregano has been shown to have natural antibacterial and antifungal properties. Most notably, its bioactives, thymol and carvacrol, can help inhibit the growth of many different types of bacteria and fungi, such as ones that can cause food-borne illnesses. 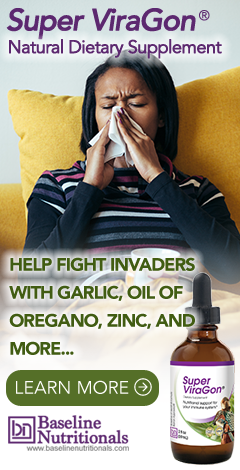 In fact, studies have shown that oregano oil appears to reduce infection as effectively as traditional antibiotics. And it’s not just that its antibacterial properties rival even pharmaceutical antibiotics such as streptomycin, penicillin, vancomycin, nystatin, and amphotericin in their ability to eliminate microbes. Wild mountain oregano has also proven useful as an antiviral and antifungal agent. Remarkably, Oil of Oregano accomplishes this without promoting the development of drug resistant strains and other problems often attributed to the use of standard antivirals and antibiotics. In addition to this already impressive list of abilities, Oil of Oregano is also a powerful parasitic expellant. These are a few of the reasons why you’ll find it in Jon Barron’s Super ViraGon formula. In addition, a study from the US Department of Agriculture showed that oregano essential oil presents antimicrobial activity against Salmonella and E. coli. Again, what's important to note about oregano oil is that most of what you'll find in traditional grocery stores is not actually wild Mediterranean oregano. The two varieties that offer health benefits include Thymus capitatus, which grows in Spain, and Origanum vulgare, which grows throughout the rest of the Mediterranean region. Look for certified organic wild mountain oregano oil in liquid form. Click here for more information on herbs that can help boost your immunity. I ENJOY, AND ACTUALLY LOOK FORWRD, FOR DR JON BARRON'S ARTICLES. THEY ARE INFORMATIVE, EASY TO READ AND TOUCH UPON INGREDIENTS WHICH ARE COMMON IN DAILY LIFE. HOWEVER, SINCE I"M A CONSUMER OF THOSE SUPPLEMENTS, I WOULD LIKE TO KNOW TO WHAT EXTENT YOU ARE USING SYNTHETIC INGREDIENTS IN YOUR SUPPLEMENTS. "Baseline Nutritionals tests every batch of product for a number of things as required by cGMP, but we go beyond the requirements by testing every batch of product for heavy metals. We understand that the highest priorities in purchasing a dietary supplement are quality, and safety and we take these both very seriously. At Baseline Nutritionals, we run every batch of every product through testing with labs that are ISO Accredited for the particular nutrient or contaminant that we're looking for. That's the best you can do! It costs more to run the tests through these labs, but our customers’ peace of mind is worth it!"